View More In Dry Shampoos. Our synergistic formula with carrot oil, almond oil and jojoba, is rich in vitamins and antioxidants, these ingredients harmoniously work together to create a highly moisturizing recipe that repairs hair damage by utilizing essential oils to restore the necessary oils to your hair and scalp. By doing this, the scalp is nourished so luscious locks and beautiful, glossy tresses can grow longer, stronger, quicker. Therapeutic dandruff treatment encourages a complete relief for your skin. By hydrating the scalp, it prevents hair loss and flakes. We add lavender to our complex formula of parsley seed and botanical keratin for improved blood circulation that aids in hair growth and has anti septic qualities to eliminate the causes of dandruff. Our formula cleans hair follicles naturally so your scalp stops itching and your hair can grow in thick, silky and smooth - without frizz. Our natural formula with silk peptides regenerates skin cells and rejuvenates and hair. It removes the toxins that naturally build up on the scalp to improve the feel and look of hair while reducing skin irritants that make you itch. Our hydrating shampoo has two parts to it. The recipe works to add volume to your hair, add shine and gloss, while also eliminating dandruff. We use only pure, botanical ingredients so no matter your hair type and skin type, our shampoo will promote lustrous hair and a pain free, itch free scalp with a light, botanical aroma. HYDRATING SHAMPOO FOR DRY HAIR moisturizes dry, itchy scalp. Our nourishing formula for sensitive skin eliminates flakes and dandruff while gently cleansing dry, damaged hair. Best natural hair care. SULFATE FREE DANDRUFF SHAMPOO FOR OILY HAIR is effective for all hair types. Paraben free & silicone free, our hypoallergenic formula has no added fragrances & moisturizer skin irritants on the scalp. FAST HAIR GROWTH TREATMENT FOR DAMAGED HAIR. Natural formula, with carrot oil, parsley seed, silk peptides & almond oil, promotes strong hair follicles & encourages smooth, long hair that won't break. BEST MOISTURIZING THERAPY SHAMPOO for kids, men & women is vitamin rich & antioxidant rich. The jojoba & botanical keratin work together to tame frizz, stop hair loss & shedding while restoring hair. PURE ESSENTIAL OIL ENRICHED NATURAL REMEDY for dry scalp soothes skin and restores glossy, sheen to hair. Our refreshing ingredients will reduce appearance of blemishes and gently cleanse your hair. 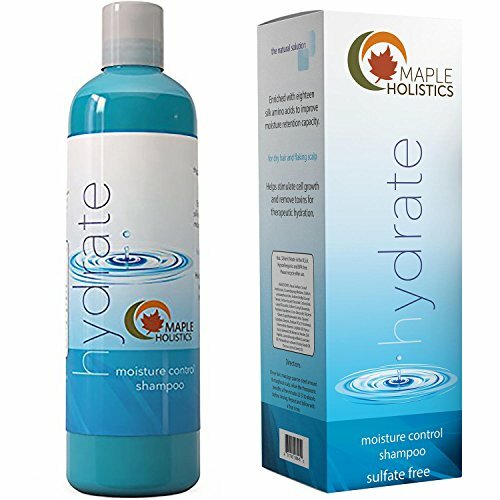 If you have any questions about this product by Maple Holistics, contact us by completing and submitting the form below. If you are looking for a specif part number, please include it with your message.